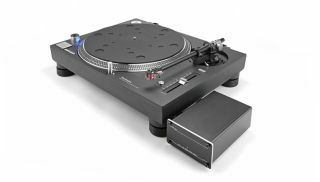 Timestep launches heavily modified Technics SL-1210GR | What Hi-Fi? What's better than the Technics SL-1210GR? How about a version with a better tonearm and new cartridge, courtesy of the Devon-based company Timestep? The Technics SL-1210GR is the slightly more affordable version of the awesome SL-1200G, and one of the biggest turntable launches of the year. And now a UK company has gone all out to make it even better. Devon-based turntable tinkerer Timestep has played around with the deck, making significant changes. The result is the Evo GR. First up is the tonearm. Instead of the standard component from the original SL-1200, the Evo GR uses a Michell TecnoArm. According to Timestep's Dave Cawley, this is more of an audiophile arm, thanks to its low-resonance drilled armtube and under-slung counterweight. It's also black, which is more in keeping with the deck (the SL-1210GR's tonearm is silver). Timestep has also put in its own power supply, which, the company claims, eliminates the 'haze' that plagues the Technics original. It can supply the turntable with a Denon DL-110 high-output moving-coil cartridge - it "works superbly well with a moving-magnet phono stage," says Cawley - or fit any moving-magnet or moving-coil cartridge the buyer would like. It can also supply it without one, so you can fit your own. Fancy the SL-1200GR instead? Timestep can modify that for you too. The Evo GR costs £2716. For more info, check out the Timestep website.